This is the home page of the SPIRAL project. The goal of SPIRAL is to push the limits of automation in software and hardware development and optimization for digital signal processing (DSP) algorithms and other numerical kernels beyond what is possible with current tools. Can we teach computers to write fast libraries? Our flagship is the SPIRAL program generation system, which, entirely autonomously, generates platform-tuned implementations of signal processing transform such as the discrete Fourier transform, discrete cosine transform, and many others. 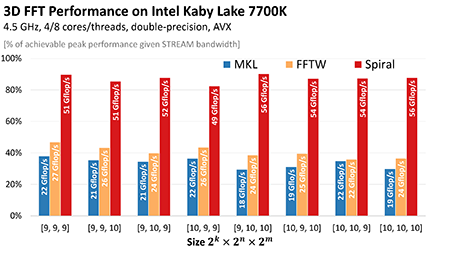 Look at a few benchmarks. But we also provide other online generators (see the right column). SPIRAL comprises an interdisciplinary team of researchers in the areas of signal processing, algorithms, scientific computing, compilers, computer architecture, and mathematics. In the domain of linear transform, and for standard multicore platforms (Core 2 Duo like), we have achieved complete automation: the computer generation of general input-size, vectorized, parallel libraries. After this paper we started to attack all forms of parallel platforms and the generation of entire libraries like FFTW. A good reference for the last version of Spiral is the encyclopedia article above. 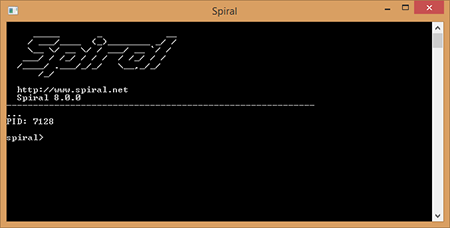 Open Source SPIRAL is available here under non-viral license (BSD-style license). This is an initial version, and there will be an ongoing effort to open source whole system. Please let us know which parts of SPIRAL you are most interested in. Commercial support is available via SpiralGen, Inc.
SPIRAL was developed over 20 years by the SPIRAL team under funding from DARPA (OPAL, DESA, HACMS, PERFECT, BRASS), NSF, ONR, DoD HPC, JPL, DoE, CMU SEI, Intel, Nvidia, and Mercury. The open sourcing of SPIRAL is an ongoing effort. The initial open source version of SPIRAL was supported by DARPA PERFECT. Please subscribe to spiral-info@lists.andrew.cmu.edu to stay up-to-date regarding SPIRAL updates and new releases. Register for the SPIRAL tutorial at HPEC 2019. We provide a number of online generators, which are easy and fun to use or play with. DFT = discrete Fourier transform, DCT = discrete cosine transform. Browse other software and hardware. If you have questions or comments about SPIRAL or our work in general, please send email to help (at) spiral.net. See bottom left of this page.